Doggie Cuddle Rugs | Vavoom! With a Vavoom! Cuddle Your Doggie Rug, you can lie down on the rug and have one of your dogs come lie down close by you, cuddling up close so that you are stroking the dog as you both doze off together. If you own more than one dog, the others can come join you for a snooze on the rug too. The rugs contain an animation by master animator Solcar Amat who makes the petting animations for the VKC Dogs. The animation is exclusive to the Vavoom! Rug and cannot be found in other products in SL. The custom made scripts in the rug utilise some of the more advanced features of the VKC Dogs that allow them to get close to you, close to each other, and place them on the rug, not floating above it. Right Click on it and choose lie down. Click on the rug and choose your dog’s name from the menu. “Pose is rest” means that the dog will go into the “rest” pose when he gets onto the rug with you. “Single Dog mode” means that the rug will place the dog that you choose from the menu as near to you as it can and in a position so that you are touching the dog. Use this when you want more than one dog to lie on the rug with you. After choosing Multi the menu disappears. Touch the rug again at the position where you want the next dog to go and then choose the dog’s name from the menu. The dog will come and lie down in that place. When you choose a different pose from the menu, the message above the text changes accordingly. If you want to go back to choosing a dog to come and cuddle up to you, click on the rug, choose Set Up and then Single. Then choose the dog’s name from the menu. The pose is automatically set to “rest” when you select Single Dog mode because this works best when the dog comes to cuddle up. The Help button displays a blue dialogue box with the basic summary of the buttons as listed here. Q. I clicked on the rug to get my other dog to come and she goes into the same place as the first dog and covers him up. How do I make her lie on a different part of the rug? A. When you click on the bed for the second dog, choose Set Up and then Multi. After you choose Multi and the menu goes away, click on the rug exactly where you want her to lie down. Q. My dog comes to lie down with me, but then she gets up and does something else. How do I make her stay with me on the rug? You can say this before she comes onto the rug or after she lies down, either is OK. When you and she get up again, you can say Sadie active and she will go back to doing things on her own again. Q. Why can’t I get my dog to do a different pose when he lies down next to me? A. I spent a long time working out how best to make the rug work and Solcar spent a long time on the animation. 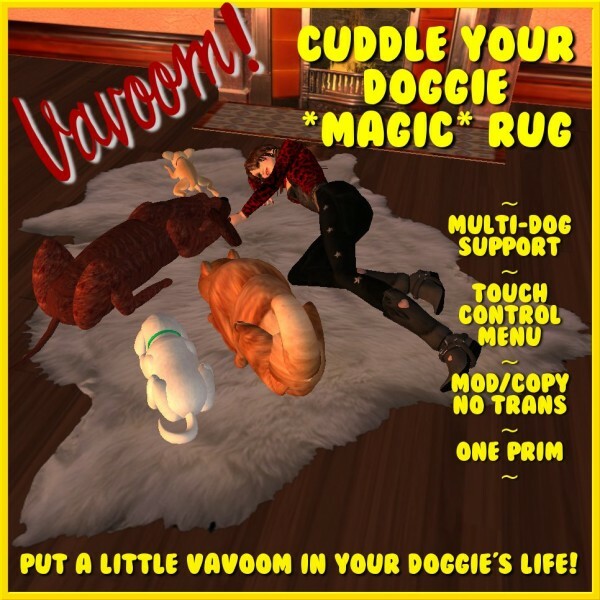 We finally decided that the rugs would work best for the majority of avatars with the majority of dogs if we restricted the cuddling dog to the rest pose.